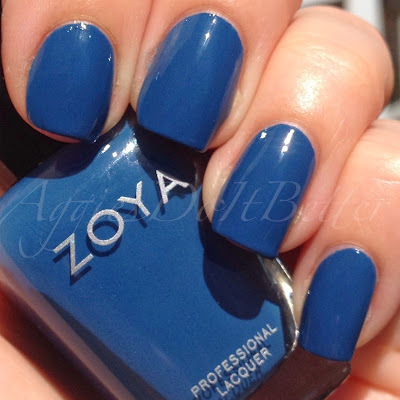 Aggies Do It Better: Zoya Peter Som 2014 Swatches, Review and Comparisons! Zoya Peter Som 2014 Swatches, Review and Comparisons! Hey guys! 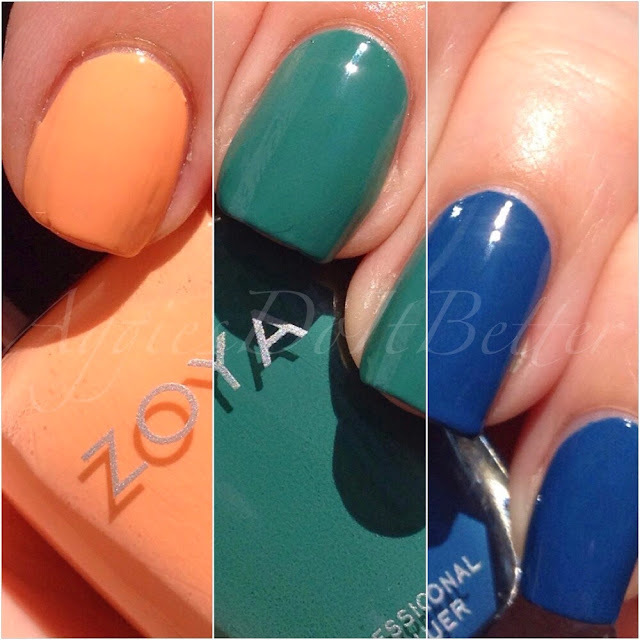 Today I have the Zoya Peter Som 2014 Collection! This is a 3 piece set that was only available for a couple weeks on their website. It was offered with a free bottle of whatever plus free shipping, that's a good deal to me! That's saying a lot! 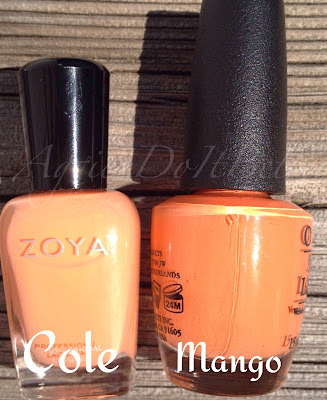 I totally ordered it the first day ;) The peach colored one is part of the spring Zoya collection, the other 2 are exclusive to this set only (and the reason I bought it!) It also came in a white box...different than the black boxes they usually use. Totally love! First is Cole. 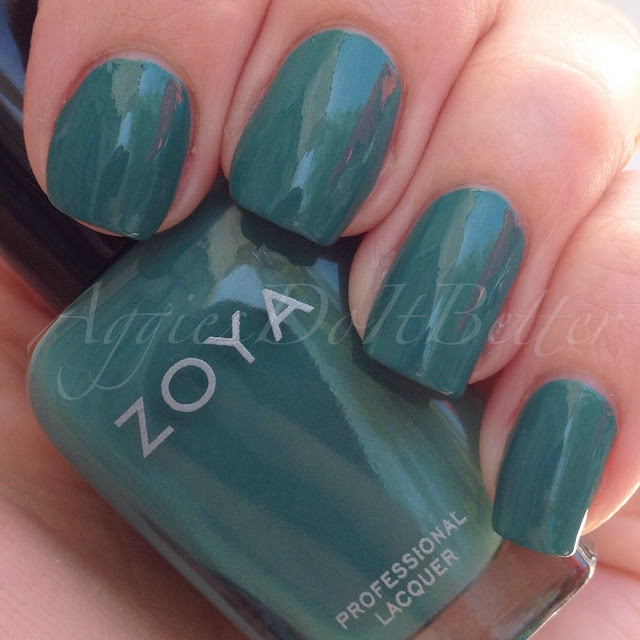 Not one I would buy on it's own, this color is just not in my wheelhouse. Having said that, they could have put a burnt orange in this box set and I still would have bought it! 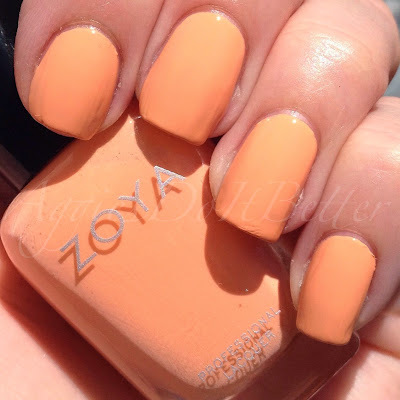 This is 3 coats, it was a little streaky for me. Still pretty for spring! 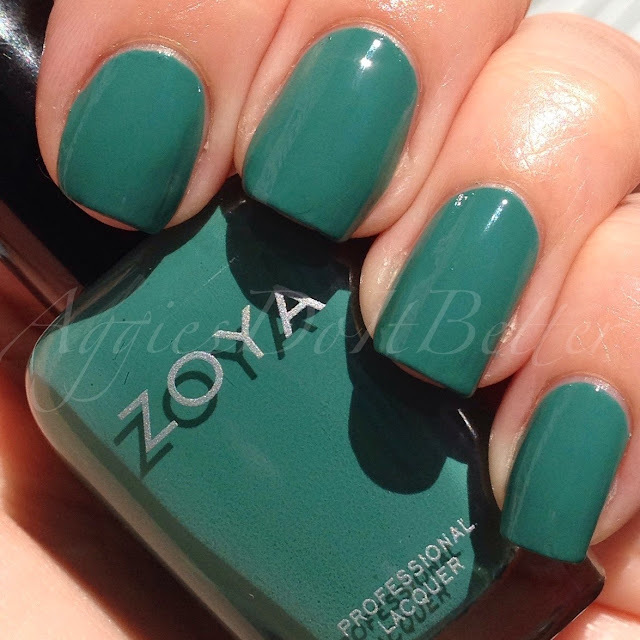 I don't have too much of this shade in my collection, the only one that comes close is one I just got recently, OPI Where Did Suzi's Man-go? It's a good bit darker. Here's a few bottle shots for comparison. On the left is Essie School of Hard Rocks, which is more gray. 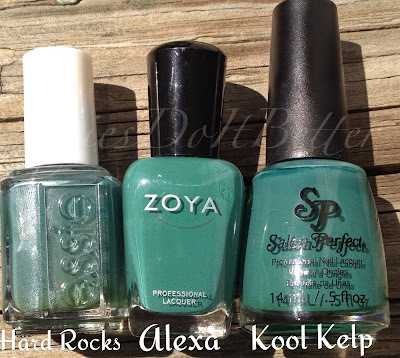 On the right is Salon Perfect Kool Kelp, which I bought because I never got my hands on China Glaze Exotic Encounters :( Salon Perfect is made by the same parent company as China Glaze and a lot of the colors are similar. KK comes really close, doesn't it? Lastly is Edie. OH, BE STILL MY BLUE LOVING HEART. This is sooooo pretty. 2 coats of perfection. 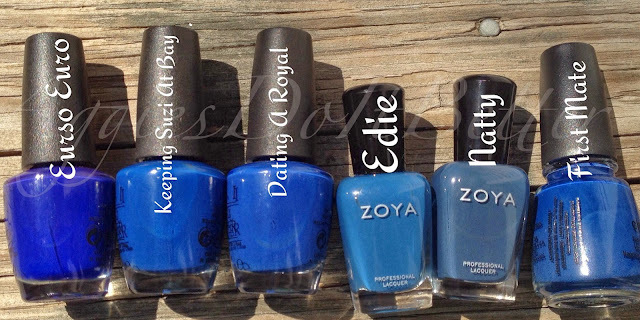 It's like a bright navy/royal blue cross. Here are a few bottle shots for comparison. In the bottle it doesn't look anything like the OPI's, but as I was putting it on I was having Deja vu with Dating a Royal and I knew people would not take my word for it so here you go! 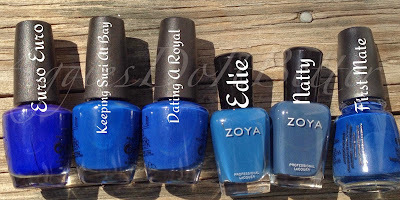 no, I don't have a problem with royal blue polishes, thankyouverymuch. They're not the same they're similar!